Once again Christians can’t seem to agree on how to worship God. It started with the 2nd Commandment not to create graven images. At the time people were making little gods to worship and God wanted a stop to that. Did God intend that commandment be applied to God? The basic question behind icons is how to reach out to God’s holiness or how the Divine relates to the human world. There is a danger to mistake the messenger for the message. Can one get caught up with a charismatic preacher instead of God? Is there a danger to focusing so much on a crucifix that if it is lost or broken it is as if God was lost? Symbols have power, during the Olympics the very act of raising a country’s flag can inspire strength. Jewish faith is against graven images. They consider God so holy they cannot even say or write the name of God even in English, using G-d. God’s name is so holy they don’t even destroy where it is written such as paper or books. Amusingly this started a debate whether one can delete emails that contain God’s name, since this was before the gigs of gmail this issue was a big deal. Rabbis have ruled that it actually isn’t God’s name written down, but an electronic representation so it’s okay to clean out your email. Once more pragmatism wins out as it usually does. Iconoclasts who are against icons believe that the clergy is needed to represent us to God such as with a church liturgy or give a benediction. Iconophiles believe that the sacred can be feely encountered by all since creation is by God so is sacred, we don’t need priests to dictate worship of God. Is this just a power play? One winning argument for Iconoclasts was that Islam had that philosophy and they had military victories. In the past Iconophile empires such as Byzantium had no problem using Iconoclast soldiers such as Paulicians who where philosophically against matter, but excellent soliders. Our souls have a need to worship God. Art is one way we do so. Humans are the only animal we know that actually creates art which requires a grasp for something more than what we can physically see or hear, we use our minds to imagine more than the now. Still we must remember to dazzled by the wondrous creation and worship the creator. A great gospel singer said that he had no problem with fans chanting his name at the beginning of a concert, but if at the end of the concert they weren’t instead shouting Jesus then he had failed. 2. Consider the iconoclast policies of Emperor Leo III and go over their reasons for going against the use of icons in Orthodox worship. Did iconoclast emperors’ policies help or hinder the empire? Christian worship by the sixth century had developed a clear hierarchy of intercession, which regulated the access of believers to the divine. This hierarchy constituted the Trinity at its pinnacle (with Christ as its most accessible member because of his human experience), followed by the Virgin, referred to as the ‘God-bearer’ or Theotokos in Greek writing, the saints, and finally, the believer. Thus, in order to obtain divine favour, believers would pray to saints or the Theotokos in order that this intercessor might pass on their prayer to Christ. The notion of physical proximity to the holy increasing the power of intercession was also well-established by the sixth century. Believers would, therefore, make pilgrimages to places sanctified by the physical presence of Christ or prominent saints, such as the site of the Holy Sepulchre in Jerusalem. Proximity could also be gained by access to relics, objects (rather than places) which were a part of the remains, or had come into contact with, Christ, the Virgin or a saint. Relics, a firmly embedded part of veneration by this period, increased the availability of access to the divine but were not infinitely reproducible (an original relic was required), and still usually required believers to undertake pilgrimage or have contact with somebody who had. The use and abuse of images had greatly increased during this period, and had generated a growing opposition among many in the church, although the progress and extent of these views is now unclear. Images in the form of mosaics and paintings were widely used in churches, homes and other places such as over city gates, and had since the reign of Justinian I been increasingly taking on a spiritual significance of their own, and regarded at least in the popular mind as capable of possessing capacities in their own right, so that “the image acts or behaves as the subject itself is expected to act or behave. It makes known its wishes … It enacts evangelical teachings, … When attacked it bleeds, … [and] In some cases it defends itself against infidels with physical force …”. Key artifacts to blur this boundary emerged in c. 570 in the form of miraculously created acheiropoieta or “images not made by human hands”. These sacred images were a form of contact relic, which additionally were taken to prove divine approval of the use of icons. The two most famous were the Mandylion of Edessa (where it still remained) and the Image of Camuliana from Cappadocia, by then in Constantinople. The latter was already regarded as a palladium that had won battles and saved Constantinople from the Persian–Avar siege of 626, when the Patriarch paraded it around the walls of the city. Both were images of Christ, and at least in some versions of their stories supposedly made when Christ pressed a cloth to his face (compare with the later, western Veil of Veronica and Turin shroud). In other versions of the Mandylion’s story it joined a number of other images that were believed to have been painted from the life in the New Testament period by Saint Luke or other human painters, again demonstrating the support of Christ and the Virgin for icons, and the continuity of their use in Christianity since its start. The events of the seventh century, which was a period of major crisis for the Byzantine Empire, formed a catalyst for the expansion of the use of images of the holy and caused a dramatic shift in responses to them. Whether the acheiropoieta were a symptom or cause, the late sixth to eighth centuries witnessed the increasing thinning of the boundary between images not made by human hands, and images made by human hands. Images of Christ, the Theotokos and saints increasingly came to be regarded, as relics, contact relics and acheiropoieta already were, as points of access to the divine. By praying to an image of a holy figure, the believer’s prayers were magnified by proximity to the holy. This change in practice seems to have been a major and organic development in Orthodox worship, which responded to the needs of believers to have access to divine support during the insecurities of the seventh century. It was not a change orchestrated or controlled by the Church. The events which have traditionally been labeled ‘Byzantine Iconoclasm’ may be seen as the efforts of the organised Church and the imperial authorities to respond to these changes and to try to reassert some institutional control over popular practice. The goal of the iconoclasts was to restore the church to the strict opposition to images in worship that they believed characterized at the least some parts of the early church. Theologically, one aspect of the debate, as with most in Orthodox theology at the time, revolved around the two natures of Jesus. Iconoclasts believed that icons could not represent both the divine and the human natures of the Messiah at the same time, but separately. Because an icon which depicted Jesus as purely physical would be Nestorianism, and one which showed Him as both human and divine would not be able to do so without confusing the two natures into one mixed nature, which was Monophysitism, all icons were thus heretical. Reference was also made to the prohibitions on the worship of graven images in the Mosaic Law but the nature of Biblical law in Christianity has always been in dispute. However, no detailed writings setting out iconoclast arguments have survived; we have only brief quotations and references in the writings of the iconodules. A thorough understanding of the Iconoclast period in Byzantium is complicated by the fact that most of the surviving sources were written by the ultimate victors in the controversy, the iconodules. It is thus difficult to obtain a complete, objective, balanced, and reliably accurate account of events and various aspects of the controversy. The period was marked by intensely polarized debate amongst at least the clergy, and both sides came to regard the position of the other as heresy, and accordingly made efforts to destroy the writings of the other side when they had the chance. Leo III is said to have ordered the destruction of iconodule texts at the start of the controversy, and the records of the final Second Council of Nicaea record that books with missing pages were reported and produced to the council. Many texts, including works of hagiography and historical writing as well as sermons and theological writings, were undoubtedly “improved”, fabricated or backdated by partisans, and the difficult and highly technical scholarly process of attempting to assess the real authors and dates of many surviving texts remains ongoing. Most iconoclastic texts are simply missing, including a proper record of the council of 754, and the details of iconoclastic arguments have mostly to be reconstructed with difficulty from their vehement rebuttals by iconodules. Assertion that the biblical commandment forbidding images of God had been superseded by the incarnation of Jesus, who, being the second person of the Trinity, is God incarnate in visible matter. Therefore, they were not depicting the invisible God, but God as He appeared in the flesh. They were able to adduce the issue of the incarnation in their favour, whereas the iconoclasts had used the issue of the incarnation against them. They also pointed to other Old testament evidence: God instructed Moses to make two golden statues of cherubim on the lid of the Ark of the Covenant according to Exodus 25:18–22, and God also told Moses to embroider the curtain which separated the Holy of Holies in the Tabernacle tent with cherubim Exodus 26:31. Further, in their view idols depicted persons without substance or reality while icons depicted real persons. Essentially the argument was “all religious images not of our faith are idols; all images of our faith are icons to be venerated.” This was considered comparable to the Old Testament practice of only offering burnt sacrifices to God, and not to any other gods. Regarding the written tradition opposing the making and veneration of images, they asserted that icons were part of unrecorded oral tradition (parádosis, sanctioned in Orthodoxy as authoritative in doctrine by reference to Basil the Great, etc. ), and pointed to patristic writings approving of icons, such as those of Asterius of Amasia, who was quoted twice in the record of the Second Council of Nicaea. What would have been useful evidence from modern art history as to the use of images in Early Christian art was unavailable to iconodules at the time. Emperors had always intervened in ecclesiastical matters since the time of Constantine I so it would be difficult to ascertain whether or not their policies helped or hinder the empire. Nevertheless, the intervention of state politics into ecclesiastical matters is common thread throughout history in disputes of theology and doctrine. Photios was known for his great intellect and learning. He wrote a summary review of around four hundred works of Christian and pre-Christian writing that he had read in his first three decades of his life, which was quite a remarkable feat in the ancient world. (loc. 8938) His great learning aroused suspicions among monks who considered him a pagan and also frowned upon the fact that he wasn’t originally a monk. All these suspicions also led to a power struggle with the previous Patriarch Ignatios. Ignatios was to have a sympathetic ear from Pope Nicholas I. (Also the fact that Photios couldn’t speak Latin wasn’t too endearing to Rome.) Photios and Nicholas formed a tense relationship with one another that centered around the future Christian alignment of a vast region that bordered along southern central Europe in the Balkans and along the Adriatic coast. It was widely believed that Photios was the author of the preface to a new law code issued by Emperor Basil I called Epanagge or ‘Proclamation’ that stated that it was the Orthodox patriarch’s duty to win over all unbelievers as well as to promote orthodoxy in belief. This was to propel his passion for going on missions to the east, especially to Armenia. But these missions to Armenia had another ulterior motive as well – to seek support against Pope Nicholas I. Photios scored a major victory for the Orthodox Church when Khan Boris of the Bulgars in 863 accepted Christian baptism by the Byzantine Church rather than the Catholic Church after having converted to Judaism. This was important to the Byzantines because it halted an alliance between the Bulgars and the Frankish western neighbor King Louis the German, that could’ve threatened Byzantine borders. However, Khan Boris continued diplomatic bargaining with Roman bishops over his Bulgarian Church which infuriated Photios. 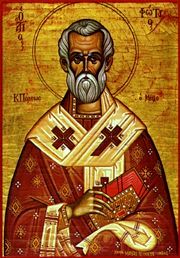 Tensions between Photios and Nicolas were to run so high because of this that in 867, they both personally excommunicated each other over a theological question that arose in the Bulgarian Church concerning the increasing Western use of the Filioque* clause of the Nicene creed. (loc. 8990) These issues were to have an impact on the furthering schism between the East and West. Patriarch Photios’s time as Patriarch of the Orthodox Church shows how having a seat of power in the church does not solely entail doctrinal or spiritual concerns, but very much so political ones as well. Just like the Pope, the Patriarch wielded tremendous political power. The marriage between politics and the Church (whether Rome or the Byzantine Orthodox or even the evangelical churches today) will always remain for better or worse. It seems as if Photios’ missionary aims coincided well with Byzantine imperial aims of expanding the Empire towards the west. Both the emperor and Patriarch fed off of one another’s goals to maintain the Empire. It seems like the Byzantines used the Orthodox Church as an extension of their political might and power. It brings to question if this is what Christ had envisioned for his Kingdom to be like – is it something that is purely spiritual in nature or did Jesus intend on incorporating his message into political institutions of power? I’m inclined to believe that he wouldn’t have intended or wanted his kingdom to expand through such means as warfare and imperial expansion. But such is the cost of free will. Oh, here is the post. Okay. Thanks for liking the post and our site. Just subscribed to your site as well. (Great looking site btw!) Such a fascinating topic, esp. for those who basically grew up knowing only about the Catholic and Protestant traditions; so for many in our group, this is really new territory for us. Most of us come from Catholic, Presbyterian, and Pentecostal backgrounds. With one of our members, her dad comes from a Ukrainian Orthodox background so she was a bit more familiar w/ Orthodox services, although she is now more of a non-denominational Christian. I’ll definitely spend time reading and learning from your site. Ukraine is divided in it’s different Orthodox churches: there is the Ukrainian Orthodox Church – Kiev Patriarchate, the Ukrainian Autocephalous Orthodox Church, and the Ukrainian Orthodox Church, which is the Moscow Patriarchate. About 20 percent of the people are Uniates or Ukrainian Greek Catholic, too, because of the Union of Brest from 1596. Western Ukraine is thus more Catholic, and thus more Western, in character. There are many irreligious there, too! Western Ukraine became Eastern Catholic because of the Polish-Lithuanian Commonwealth, since they ruled traditionally Orthodox places like some of Western Russia, Ukraine, Belarus, Northern Moldova and some of the North of Romania. They became a Commonwealth in 1569, both Lithuanians and Poles ruling this empire, and this came after wars and alliances between both ethnicities during the 14th and early 15th centuries. My family comes from both Eastern Ukraine and Western Russia, but I primarily think of myself as Russian, since I was born in Rostov, Russia, know more Russian than Ukrainian, have a Russian passport and I know more about Russian politics and what not than I so Ukrainian. But I am very sad about the situation in Ukraine right now. It makes Orthodox countries look bad. I’m not sure how this situation will be resolved. I don’t live that far from Ukraine, after all. Also, Kiev is where Russian Orthodox Christianity was born, of course, with the conversion of the Holy Rus to Christianity with the Baptism of Czar Vladimir of Kiev in 988 A.D. Boris and Gleb were the first martyrs later on of Russia, who were also the first saints to be canonized in the Church in 1071 A.D, and were killed before this by Prince Sviatopolk anywhere from 1015-1019 A.D. Boris was ruling Rostov as a prince, and Gleb was ruling the more Eastern city of Murom. He considered them as political agitators, and a threat to his power and dominance. As you can guess, he was a horrible man, lacking in piety. A lot of Kievan Rus was centered around Ukraine and Western Russia until the Mongols, being led by Genghis Khan, invaded us in the early 13th century and took over our Kingdom. They came via the steppes and the Golden Horde. Boris and Gleb are my patron saints, by the way. Moscow then replaced Kiev as the capital, and Moscow even became a new patriarchate in 1589, replacing Constantinople as the third Rome, since Constantinople was overrun by Turkish Muslims since the Fall of Constantinople in May 29th 1453, and later came the taking over of the Kingdom of Trebizond in 1461 after the Fall of Constantinople. It only made sense that we succeeded Constantinople as a patriarchate, since the Ecumenical Patriarchate has so little influence in the land it resides now, where as the Russian Orthodox Church is the biggest Eastern Orthodox Church in the world! Our clergy used to be trained by the Byzantines, and sent to us, but then we became independent, and chose our own clergy. As you can see, just from some of the information I just gave, the Eastern Orthodox Church has a strong and ancient history in Christianity, and I am glad you desire to learn more about it, and are open to new things. Many Catholics don’t seem to realize that the Eastern Orthodox Church is just as old as the Catholic, or even possibly older! All the seven ecumenical councils were convoked from 325-787 A.D in Asia Minor, after all, which was Byzantine or Eastern Roman at the time, and was majority Eastern Orthodox Christian, though there were obviously times when the Empire broke away from traditional Orthodox Christianity, and supported heresies like Arianism, the Macedonian heresy, Nestorianism, Monophysitism, Monoenergism, Monothelitism, Iconoclasm, Paulinists, and the Bogomils, among others. The holy seven councils dealt with these heresies, of course, and defined what the Church believed in. I have also noticed many people, both Catholic and Protestant, have never even heard of the Eastern Orthodox Church. Indeed, I once read a book by Thomas Asbridge about the First Crusade, and he only mentions the fact that the Byzantines were Orthodox once, and did not even say Eastern Orthodox, which differentiates us from the Orientals, who believe in only one Nature and one Will of Christ. He hardly even looks at the East-West schism of 1054 A.D between the Orthodox and the Catholics, nor does he describe the differences between the two very well, which one would think would be significant when it comes to relations between the Greeks and the Latins. The whole entire book just concentrates on the Catholics vs. the Muslims, and entirely disregards the Orthodox Christians as even remotely important, which they were, of course, since all the modern Orthodox countries were Orthodox by that time already, and important, too. And not to mention the fact that 4 of the ancient patriarchates are Orthodox (though there are rival Oriental Orthodox Patriarchates in Alexandria and Antioch, though.) This book was certainly written with a Western perspective, by a man that knows very little about Eastern Christianity. Thanks for your liking my blog and becoming a follower. I needed more people to see my blog, and I am glad the word is finally getting out. I study at my seminary here in Rostov, and plan to be a part of the clergy or a monk in 2 or 3 years time, God of course helping which to choose out of the two in the end: a monk or an unmarried clergyman. But I hope I do everything by God’s aid, and not for human reasons. I don’t want that, after all. Power is irrelevant to me. I am sure you will like my blog. We have some pretty interesting history, and gorgeous churches, monasteries, convents, icons, vestments and the like. You can never run out of things to discuss in the Orthodox faith. I have looked at and studied Western Christianity too, like St Catherine of Siena’s writings, St Thomas Aquinas, St Gregory of Rome, St Bede the venerable, St Augustine, St Teresa of Avila, Thomas Kempis, the Rule of Benedict, the Cloud of Unknowing, St Anselm of Canterbury, the New Jerusalem Bible, the Golden Legend by an Italian priest who’s name I have forgotten, St Jerome, and others which I can’t recall right now. I have read the Catechism, too, and went with a Uniate friend of mine to Church, and I went with a Latin Catholic to Church several times, too! I have also been to places like France, Belgium, Italy, Mexico, Spain, Poland, Hungary, Czech Republic, Portugal, Brazil, Vatican City, Guatemala, Croatia, Austria and Malta. So it is safe to safe to say I know a lot about both churches, the Catholic and the Orthodox ones. I know about the basics of Protestant Christianity, but not the detailed stuff. Been to the USA, Australia, Canada, the UK, Northern Germany (which is Protestant) , Sweden, Finland, Denmark, Estonia, Latvia and Denmark, too! I went to most of these places for short trips when I was younger, since my father used to be a diplomat (he is retired, now.) We even lived in Saudi Arabia for 5 years one time, which was horrible, of course. I left 8 years ago, when I was 19 years old. It’s interesting to see these 3 main confessions, along with the two minor ones (Evangelicals and Oriental Orthodox Christians, who are the most similar to us.) I do not really think of Mormons and Jehovah’s Witnesses as Christian, though, since they do not believe in the Trinity, which is a very important belief in Christianity. How long have you been blogging for? Your blog is nice, by the way! I always enjoy blogging myself. Wow, that’s a lot of info about Russian Orthodoxy. We’ll most likely cover a great deal of Russian Orthodoxy sometime around March I believe, so i think you’ll like it. Next coming weeks we’ll be focusing on the Byzantine involvement in the Crusades, so stay tuned. We started our group, Project Augustine, in the summer of 2012 and i posted this blog site up not too long ago, around the end of Nov. 2013. I have been blogging since December 2013. I decided to start this blog to teach more about the faith, and to warn fellow Orthodox Christians about ecumenism and discarding of ancient traditions in our Church. We are, of course, the most conservative of the Churches, and we pride ourselves on our tradition and customs, which we feel and believe have been handed down by Christ Himself to His Apostles. I don’t want the same thing to happen to us as in the West with Vatican II. These are, of course, my personal beliefs, and the West can do what it likes, but I wish for my Church to stay the way it is, apart from improving of morals and numbers, of course. Our Church is a big part of traditional Russian life and values. I am trying desperately to get new followers and comments on my blog, but it is taking time, of course. I wish for more to see it, and tell me what they think. I love learning from others, too! Have a good day, and God bless! I started to get more hits on my blog when i started linking my site with social media: so i would start a facebook page and a twitter page, and announce updates to your site on facebook and twitter. Include hashtags like #Orthodoxy #Orthodox_Church etc. on them so that people who are searching for those terms can find you perhaps. Make a page on google+ as well. Hope this helps. God bless.